The PLUS Southeast Chapter recently made a grant to the Combat Wounded Veteran Challenge, LLC in Tarpon Springs, Florida as part of the 2015 PLUS Foundation Chapter Charity program. The $2,500 grant will be used by the organization to advance their mission. Combat Wounded Veteran Challenge provides support to wounded veterans and their families through rehabilitative therapeutic expeditions (challenges) as teams obtain their objectives and know they are not alone, while providing encouragement to overcome limitations and embrace life. The organization also offers support for those suffering traumatic brain injuries, post traumatic stress, orthotics and/or prosthetics. 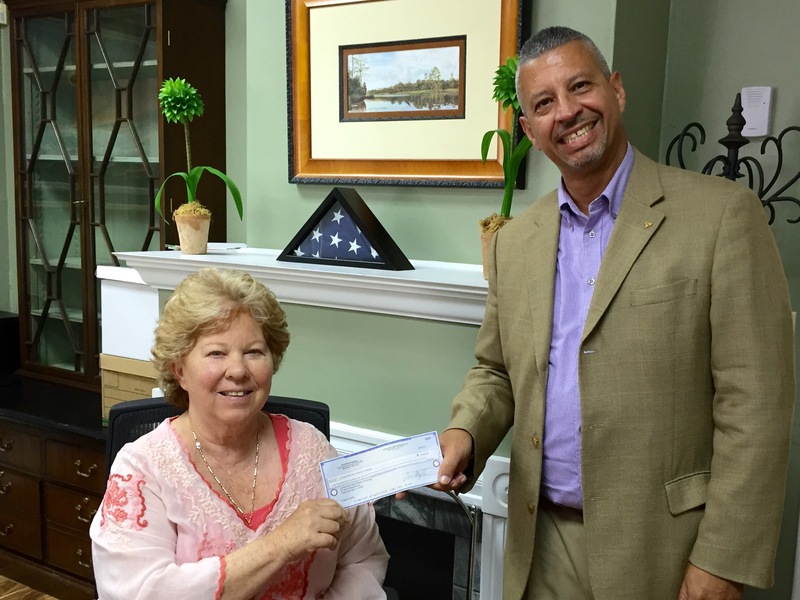 Juan Borda of SCU Orlando, a Division of CRC, presents a check for $2,500 to Carol Martin, the Founder of Combat Wounded Veterans Challenge as part of the PLUS Foundation Chapter Charity program. This entry was posted in Chapters, PLUS Foundation and tagged Chapter Charity, Southeast Chapter by plushq. Bookmark the permalink.